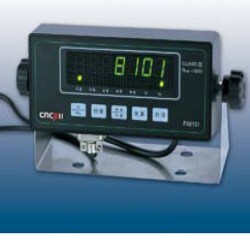 CnCells PA8101 is a general purpose basic digital indicator housed in a standard ABS enclosure. It comes with a large (.75") LED screen for easy readout of up to 50,000 display divisions, and supplies enough current for up to four 350-ohm load cells. All setup parameters may be entered via the front panel keys. The PA8101 is a general purpose, "no frills" digital indicator housed in a standard ABS enclosure. It comes with a large (.75") LED screen for easy readout of up to 50,000 display divisions, and supplies enough current for up to four 350-ohm load cells. All setup parameters may be entered via the front panel keys. The CnCells PA8101 Digital Weight Indicator uses full duplex RS-232 serial format for communication with many types of attached support equipment.